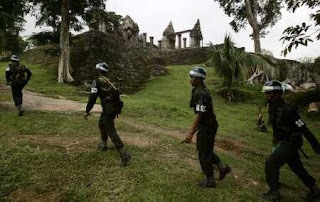 ARANYAPRATHET, Thailand - Thailand and Cambodia began high-level talks on Monday aimed at resolving a military stand-off over the disputed Preah Vihear temple on their joint border. After a week of diplomatic sparring and a build-up of troops, expectations for a breakthrough were low, but both sides said they wanted to ease tensions in a dispute that has regional neighbours worried it could turn violent. "We believe they will agree to our reasonable offer which will help ease the tension along the border," Thai Supreme Commander Boonsrang Niumpradit told reporters before meeting Cambodian Defence Minister Tea Banh. "We hope they will have a similar offer that we can accept," Boonsrang said, without giving details of the Thai proposal. The two met in the Thai border town of Aranyaprathet, about 350 km (215 miles) from the 11th century temple that has been a source of tension for decades after it was bestowed by an international court to Cambodia in 1962. Hundreds of Thai and Cambodian troops have faced each other at the temple since last Tuesday, backed up by several thousand more troops and heavy artillery on both sides. In Phnom Penh, government spokesman Khieu Kanharith did not expect a swift end to the stand-off, but "at least it will ease some of the tension because both sides have agreed to sit down at the negotiating table." At the heart of the dispute is a 4.6 sq km (1.8 sq mile) area around the temple, which sits on a jungle-clad escarpment that forms a natural boundary, that is claimed by both nations. Cambodia complained to the U.N. Security Council on Friday about Thailand's violation of Cambodia's "sovereignty and territorial integrity", but did not ask the U.N. to intervene. "While Cambodia exercises maximum restraint to avoid armed confrontation, we cannot ignore that Thai military provocation is to create a de facto 'overlapping area' that legally does not exist on Cambodia soil," Phnom Penh's U.N. ambassador Sea Kosal said.